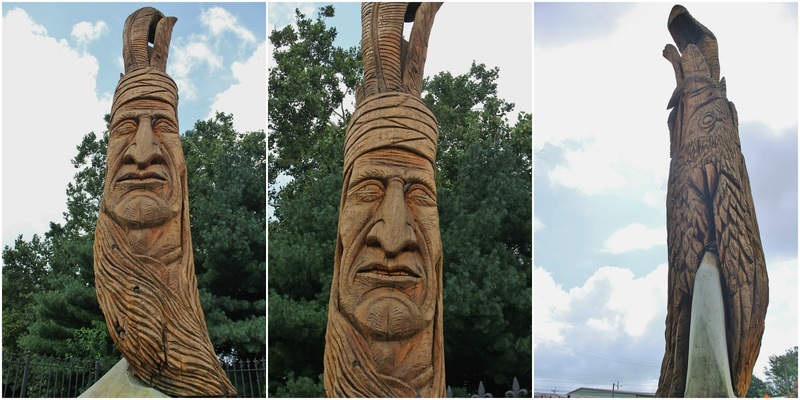 Our drive to Effingham on August 18, 2016 took a little longer than it should have due to a stop in Vincennes, IN to get a picture of the Indiana Peter "Wolf" Toth Indian. 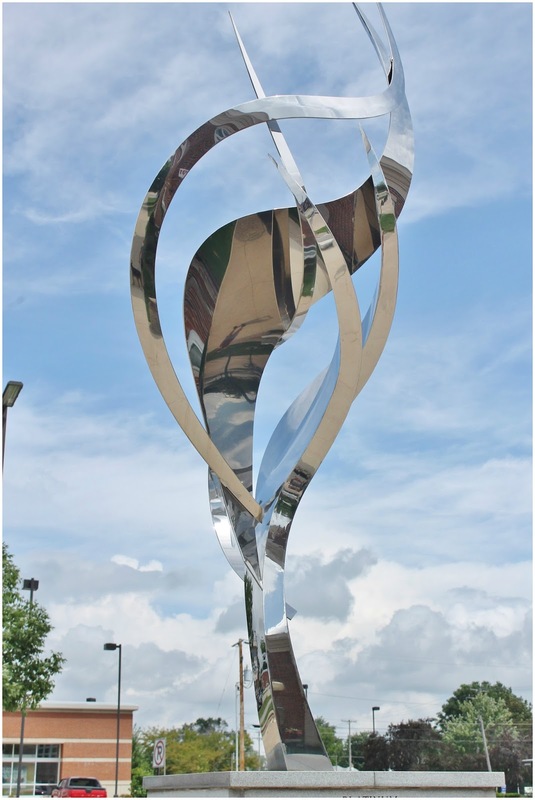 This one was built in 2009, it is made out of oak and is 23-feet tall. 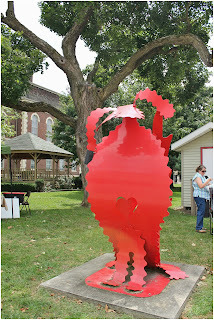 He is named Chief Tecumseh. The back of this one is much more ornate than most. 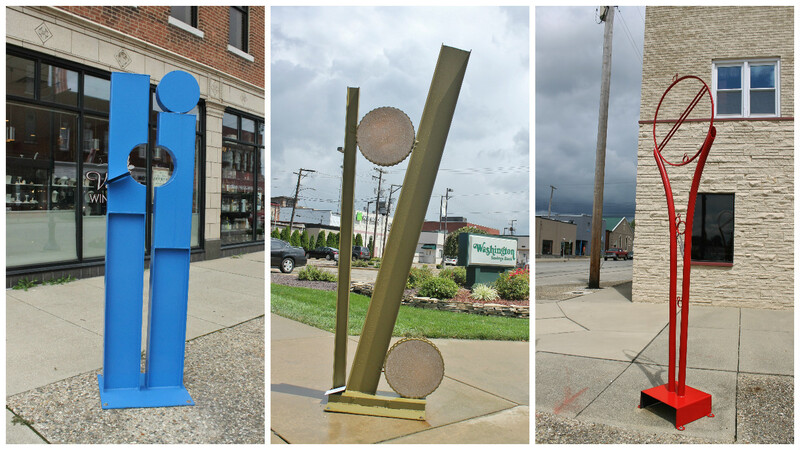 We found a couple of other Roadside Oddities in Vincennes. 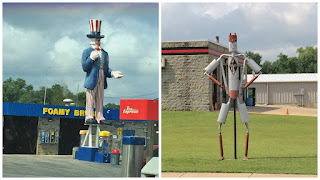 A very tall Uncle Sam at a car wash and a Muffler Man, made out of mufflers! 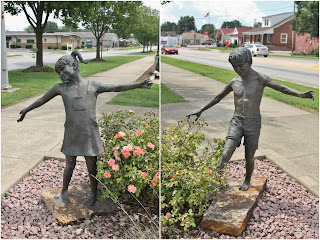 We stayed at Camp Lakewood RV Park, just north of Effingham. We love this place, the only thing missing is a pool. Most of the sites are average width and some look out over the lake. each morning was a great start to the day. We were in site #65 and loved it. It is a pull through with full hook-ups, and lots of trees. We don't use a satellite TV so we love trees for shade. The site is very wide, our 15-foot patio rug ran straight out from the door and there was still space left. We had an extra long picnic table and a fire pit. The camp manager Kaila, is super friendly and provided us with lots of local information. There is also a bar on site, with great service from Kelly O, a number of TV's, video gaming and music. 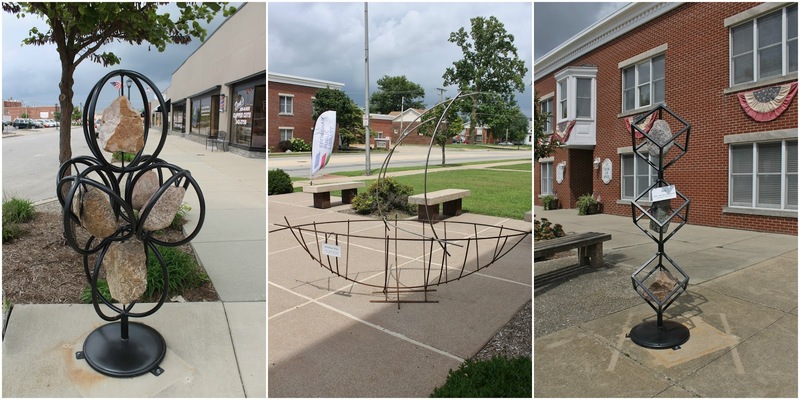 Effingham surprised us, it is much more artsy than expected. There are art sculptures all over town, we spent the better part of a day finding all of them. 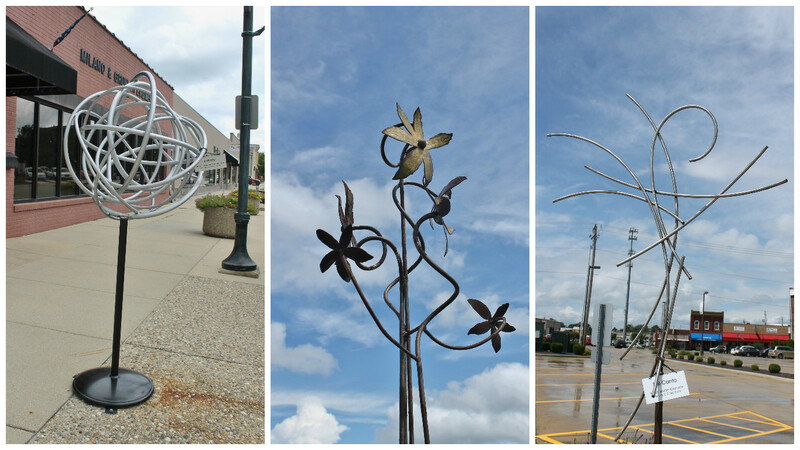 There were a number of sculpted metal ones. 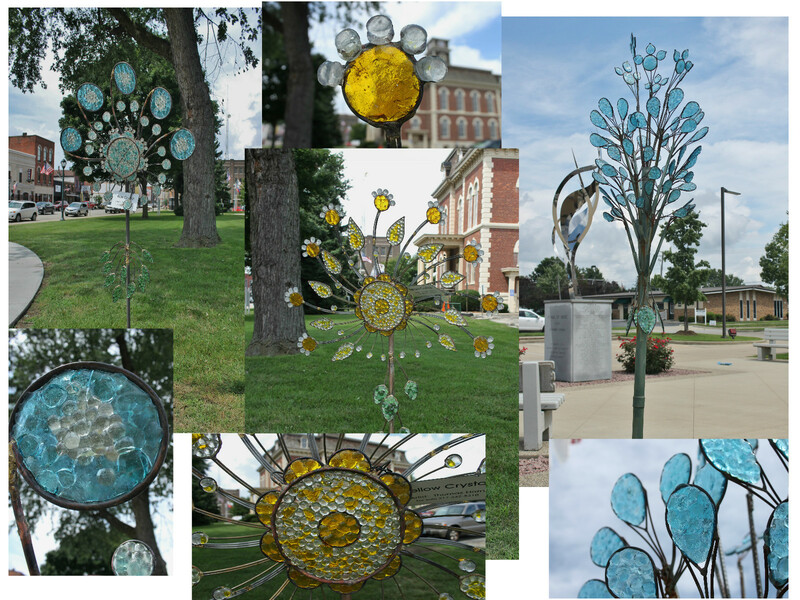 Iron was another popular medium. Then there was glass and rocks. 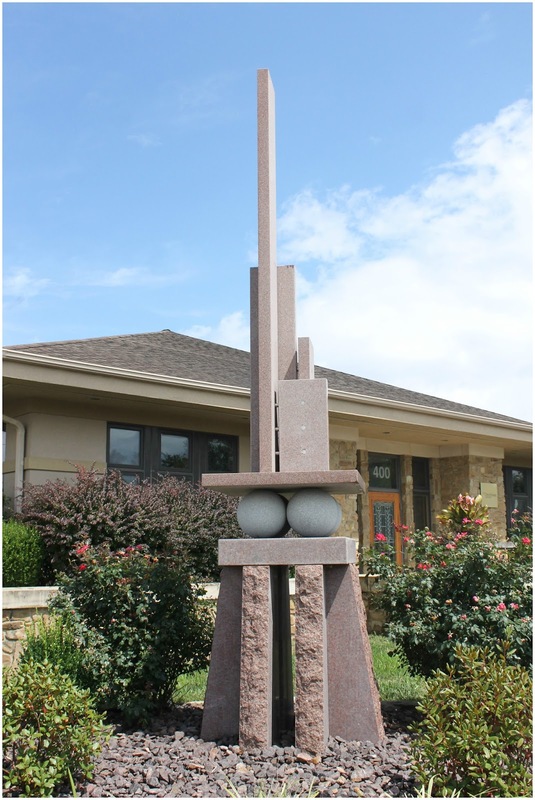 The rock sculpture is called Prairie Bearing by Jeffery Boshart and it is a representation of the surrounding corn fields. And cute kids. The two sitting on the bench did not have a plaque. We loved that someone left a truck in the book. The playful boy and girl are called Balancing Joy and Boy, they were inspired by the artist's children, created by Dana LaMair. 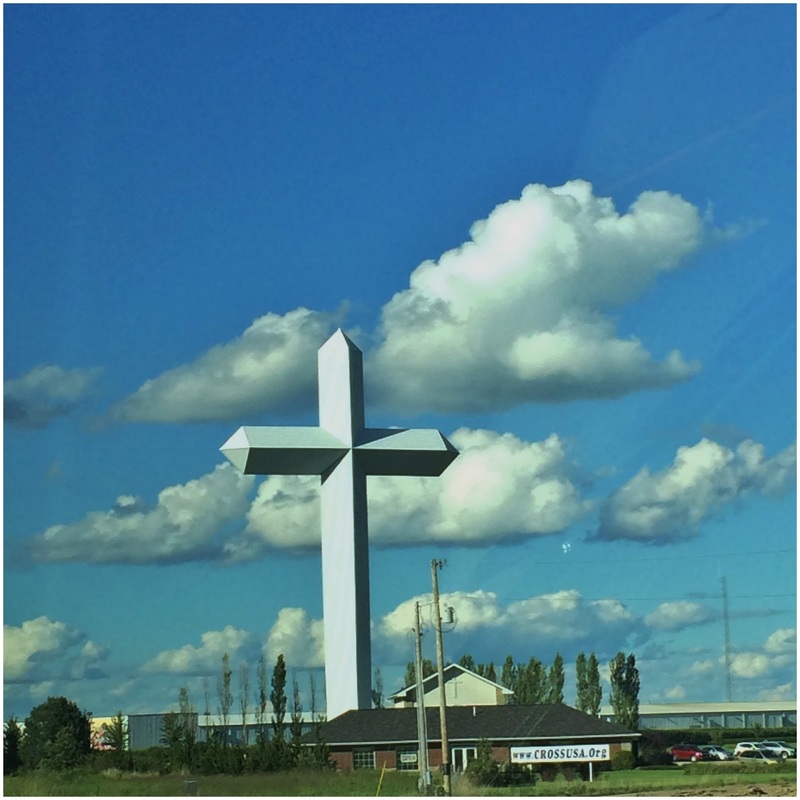 Effingham is also home to the worlds largest cross. You can see it for miles as you travel down the highway. Of course we are in the Land of Lincoln, so we did cross paths with Abe every now and then. 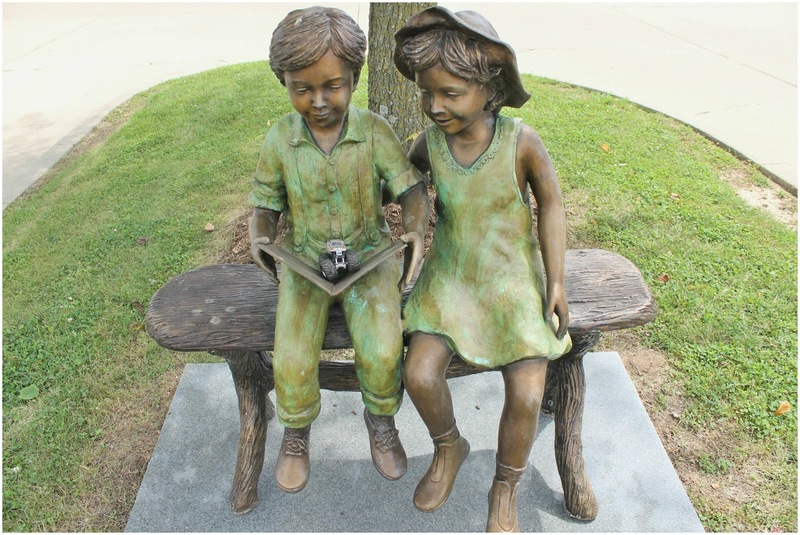 In Shelbyville there is a statue depicting the 1856 Lincoln-Thornton Debate. In Taylorsville we learned the story of Lincoln and the pigs. This was the last county seat stop on his circuit. He was quoted as saying the town was "prettily laid out". But pigs would rummage underneath the floor boards of the courthouse and sometimes disrupt the courtroom with their noise. During one session they were so loud that Lincoln stood up and demanded a "writ of quietus". 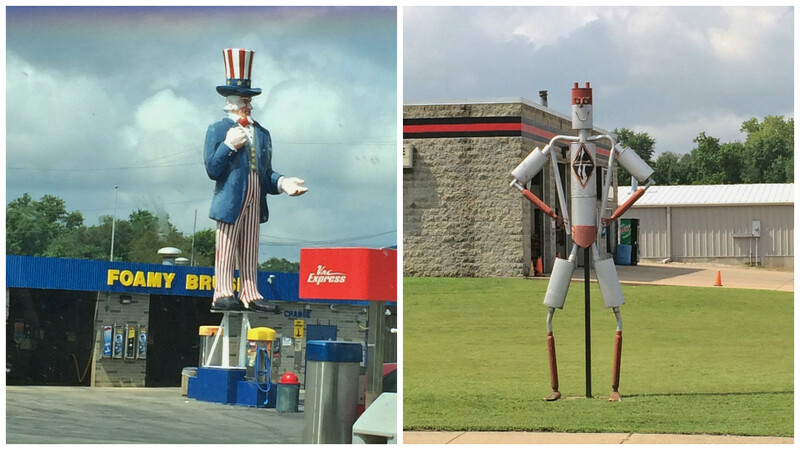 This whole stop was pretty much Roadside Oddities, as we toured the Historic Route 66. 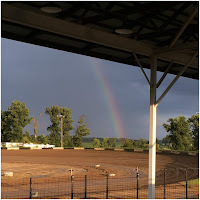 This time we picked it up in Farmersville, IL which is where we ended during our last stay in Springfield, IL, to keep this blog from being a mile long that will be covered in the next blog. On the drive to Route 66 we came across a few others. In the Oakhill Cemetery in Taylorsville, IL we found a memorial for JFK, of course he is not buried here so not sure why it's here but it is. George Franklin Bilyeu, is buried here, he is one of many miners who lost there lives fighting for safer working conditions and unions. 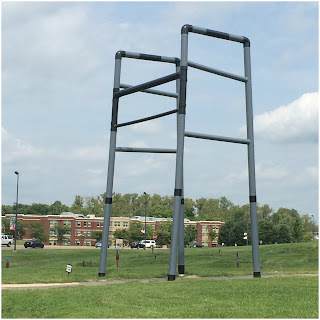 In Collinsville, IL we found the Worlds Largest Catsup Bottle and a restored Bull Durham sign. To preserve modesty all of the Bull Durham signs had strategically placed fences to cover the Bull's anatomy. 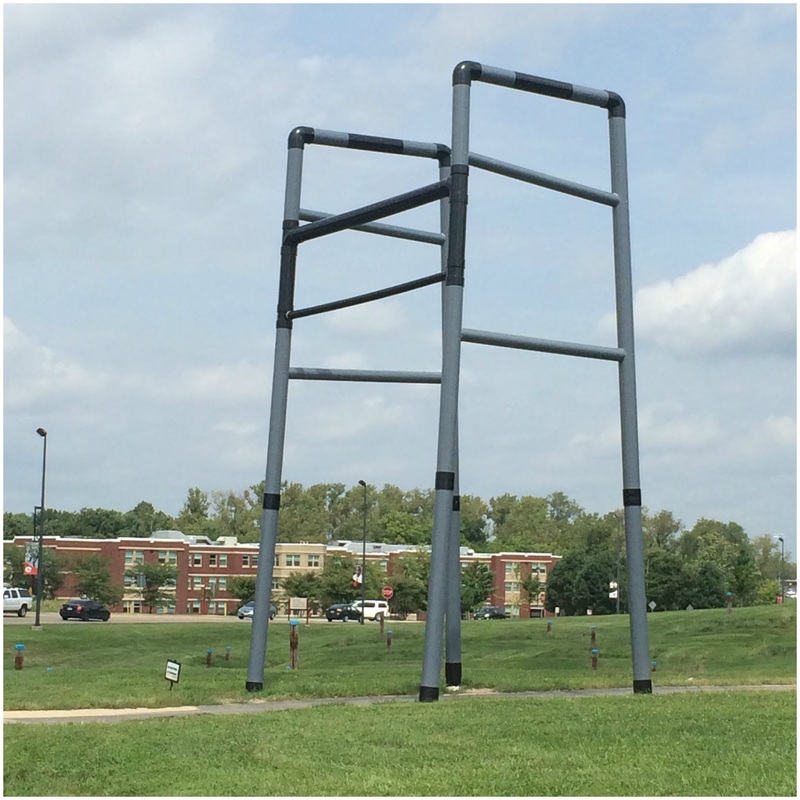 The campus of Southern Illinois University in Edwardsville has a very giant walker, maybe they are trying to get the kids ready for old age. Stockcar racing has been hard to come by as we seem to be in town, (whatever town that may be) on a weekend that there is no racing. 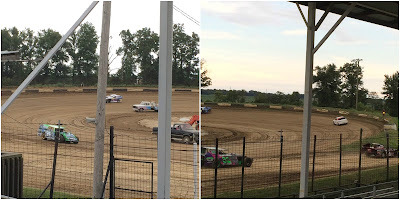 Brownstown Raceway had a race while we were here. 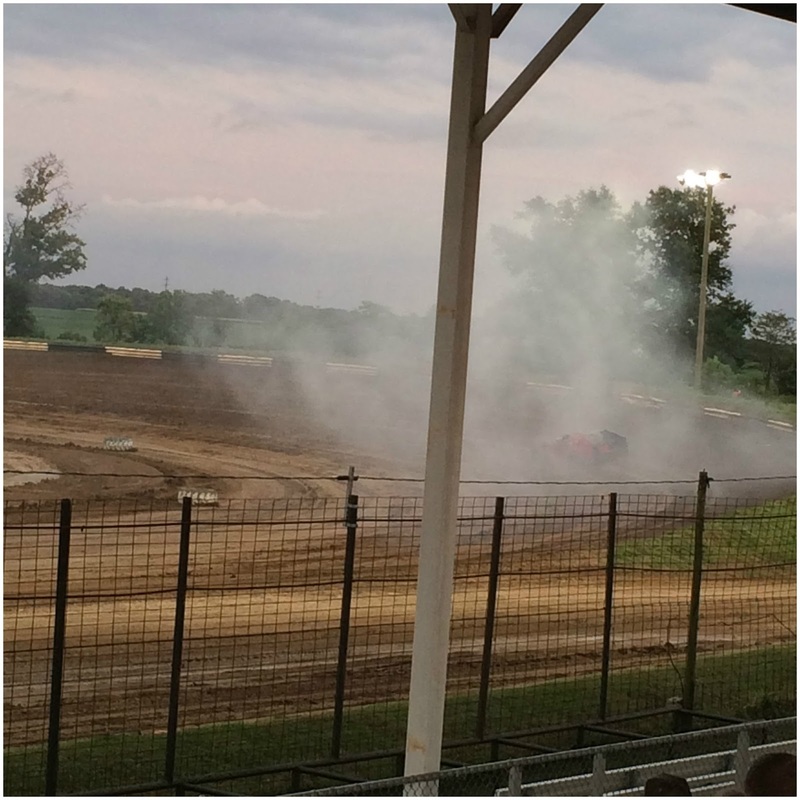 It is a 1/4 mile dirt track. 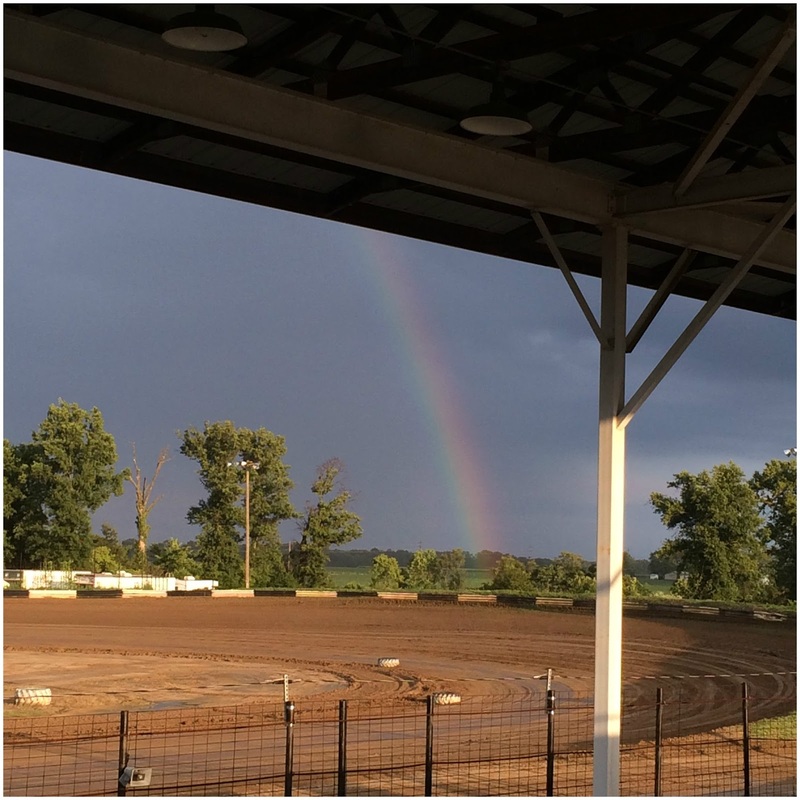 The stands are covered which is good because it rained a little, but we did get to see a rainbow. It was a lot of fun, they do not serve beer, you can bring your own but very few people did, so there was no rowdy drunken behavior. 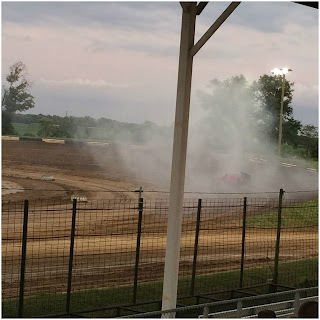 There was one scary moment when a car caught on fire, the driver was okay. Check out the next blog for the Route 66 fun. Our bedroom closet holds a lot of things besides our clothes. The floor is filled with over flow paper towel, toilet paper, plastic shoe boxes with tape, glue etc and more. It really was just a big mess. We found the solution to be a large plastic tote. Everything confined in one place and now nothings tips or moves while we are traveling, and looks a whole lot better.